Santa made an appearance at Stories Beach today. The fifth annual appearance by ol' St. Nick was accompanied by calm seas and a toasty beach fire and hot chocolate and snacks. Dec. 11, 2016 6:00 p.m. The fifth annual Santa Paddle was held at Stories Beach today. 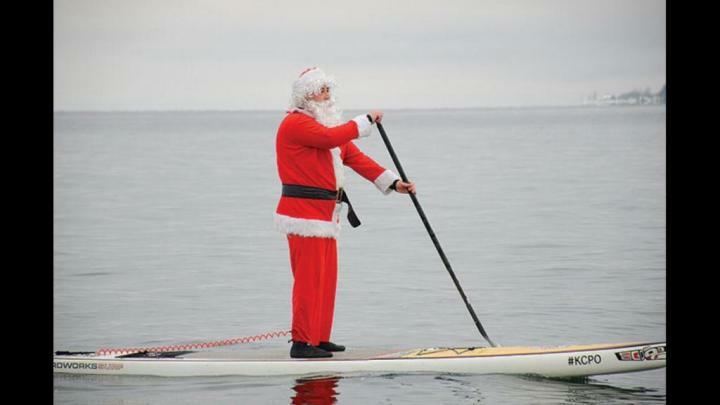 Jolly Old St. Nick picked up a paddle and launched his paddleboard and cruised along the shoreline in calm conditions returning to a snowy beach for a warm beach fire, hot chocolate and snacks.